It's surprisingly simple to make dog treats at your Springs Apartments home that are both tasty and nutritious. Here are some quick and easy ideas for homemade treats that your dog will gobble up. Before you begin, keep in mind that you should follow the same safety precautions you use in making your own meals: wash your hands frequently, avoid contamination of cutting boards and other equipment, and store the finished products properly. Making this treat is just like baking chocolate chip cookies. Dice a pound of lean beef into half-inch cubes and place them close together on a baking sheet covered with parchment paper. Place the baking sheet in the oven before heating it to 300º F and cooking for one hour. Reduce the temperature to 200º F, leave the oven door open slightly and cook for another two hours. Let the cubes dry overnight at room temperature, then place them in an airtight container and store in the refrigerator or freezer before serving. This is a doggy Thanksgiving dinner in one delicious treat. Warm some olive oil in a skillet before covering the bottom with a mixture of one egg and two tablespoons of mashed potatoes. Add a layer of a half-cup of diced cooked turkey meat and one more of a half-cup of chopped cooked veggies. Cover and simmer until the egg is cooked, then sprinkle 1/4-cup grated cheese on the top and continue cooking until cheese is melted. When cool, cut into wedges and refrigerate or freeze until serving. You can use high-quality canned dog food to make some great treats. Check to make sure that the first ingredient listed is a meat, not meat by-product, and select one with the fewest ingredients. Simply spoon out bite-sized portions onto a baking sheet covered with parchment paper and place in the freezer. Once they've frozen, place them in an airtight container and put them back in the freezer. 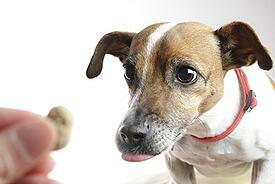 Items like cheese, cashews, blueberries and frozen peas make delicious doggy treats when used in moderation. While all these foods are safe, some dogs have sensitive digestive systems so give him one to start and watch to see how he reacts. Don't forget to count treats toward your dog's total calorie intake and cut back if he starts gaining too much weight. Does your precious pup have a favorite treat? Tell us about it in the comments!